Ipswich station being a main line station, is busy with trains to and from Norwich every half hour and trains going to Harwich, Cambridge and Harwich at other times and of course Felixtowe. 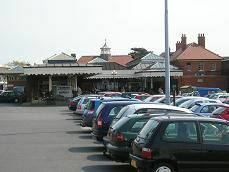 There is a stabling point to the north of the station, which has three locos in it. The train is a one-car diesel unit with about five passengers on it. 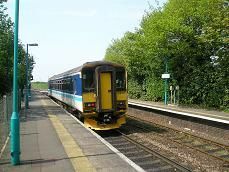 It's a funny journey to begin with as we travel up the main line in a north westerly direction, then as we leave it, we go north east as far as Westerfield. Then leaving the East Suffolk line we go south east into Ipswich again! Soon after leaving Ipswich we pass Ipswich Yard where the freight trains from Felixtowe container terminal are turned round before they go west to the Midlands and the north east. Soon after the sidings we leave the Norwich and Cambridge line at East Suffolk Junction as we continue on the East Suffolk line, which eventually goes to Lowestoft. We pass a freightliner train from Felixstowe docks waiting to join the main line and then go into a cutting and emerge the other side surrounded by fields. Soon after we reach Westerfield Station. There's no station buildings just a bus stop on the north side. We stop on the up platform, which looks pretty bare. Loots of track has been removed just after the station and straightaway we leave the Lowestoft line and continue on a single track in a south easterly direction. There's lots of greenery to begin with and then houses appear on both sides of the track again as we come back into Ipswich. We go over a viaduct with great views of Ipswich to the right and lots of allotments can be seen below us. We enter Derby Road station, Ipswich's 2nd and perhaps secret station where the line becomes two tracks again and another freightliner is waiting to take our section of track. 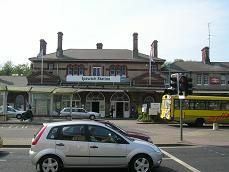 The old station building is still standing but the windows have been bricked up and on the opposite side is another bus stop. The track becomes single again and it will stay like that all the way to Felixstowe though there are plenty of signs that two tracks were once on this line. As we finally leave Ipswich behind we run parallel with the A1156 on our left as we pass out of town retail parks and then finally there is countryside once again. Many of the fields glisten with polythene covers, as this is a popular market garden area, growing all sorts of fruit and vegetables. The main A14 then passes under us as we speed up to around 70 mph and soon we can see the first cranes of Felixstowe docks on our right. We run parallel to the A14 on our left, busy with lorries going back and forth to the port and on our right there is a pig farm. We slow down again as we come into Trimley station. There is double track here but the up platform is not used and very overgrown. The down platform has the original station house, but once again the windows are boarded up. Straight after Trimley the first branch to the northern docks of Felixstowe goes off as a single track on our right and once again there is another freightliner train waiting to take our piece of track. We cross over the A14 yet again and various new housing estates start to appear on both sides of the track, indicating that we are reaching the outskirts of Felixstowe. We slow down to about 30 mph before we reach the second junction to the docks, this time to the southern part. Soon we see plenty of old sidings and we come into Felixstowe station, which is right next to a Homebase superstore, which was once part of the goods yard. It looks like the track went further down about another 10 yards as there is a large station building ahead, but it's now filled with the cars of those visiting the superstore! About 20 passengers are waiting to get on and there is a very quick turnaround of just 4 minutes for the driver to change ends. We start off on time but have to wait outside Trimley station for another freightliner train to come off our track and onto the northern docks branch line.